I love commercial structures, or at least late19th/early 20th century commercial structures. Warehouses, old schools, storefronts, scary abandoned factories. If it’s got old brick, high ceilings, and questionable asbestos abatement, chances are I’ll feel right at home. When I was in my 20s, I lived in a warehouse in downtown Seattle. It was not, actually, zoned residential, which was part of the fun. In fact, the top floor housed a production sewing firm that started their thundersome business day at 5:30 AM, causing a fine dust of unknown particulate content to sift down upon my sleeping face from the ceiling 22 feet above. We were on the second floor. There were tenants on the first floor, but they were mysterious and I never saw any of them myself, though I was assured they were there by my neighbors who’d lived in the building longer than I had. They were probably a lot more serious about whatever they were doing than we were. In theory, all of us living there were artists. We all had, at least, artistic ability. Only two (maybe three) of the dozen or so people living there at any given time were actually doing much art. There were lots of parties, lots of wandering from one’s own space to one’s neighbors’ space, lots of drunkenness and ill-considered naked behaviors. My neighbors happened to be particularly well-connected in the local music scene and we would venture out in a boisterous pack to see bands two or three nights a week. Our local music scene was just amazingly lively then, and we probably should not have been surprised when it became the international music scene nearly overnight. Suddenly, all those people we knew in bands were famous. Really famous. I suppose I ought to be showing you posters from early 1990s Seattle bar shows – yes, I saw Nirvana play in bars, many times – but even though I should have a lot of that stuff, I just don’t. I got rid of all that ephemera in an attempt to forget the crash and burn of a dramatic Big Love. This tactic was, of course, unsuccessful. I regret the losses – I could have sold that stuff for a lot of money. 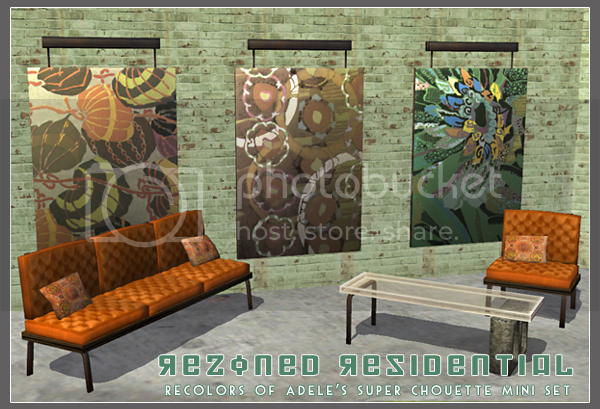 These are recolors of Adele’s Super Chouette set that was released as part of the WNF Aspiration Set for December 08. Upholstery in burgundy, blue, green, olive, rust and white. Posters in three groups, as shown. Table offered in two different cements, as well as black and white. Edouard Benedictus was not a name I knew until, well, I knew it. 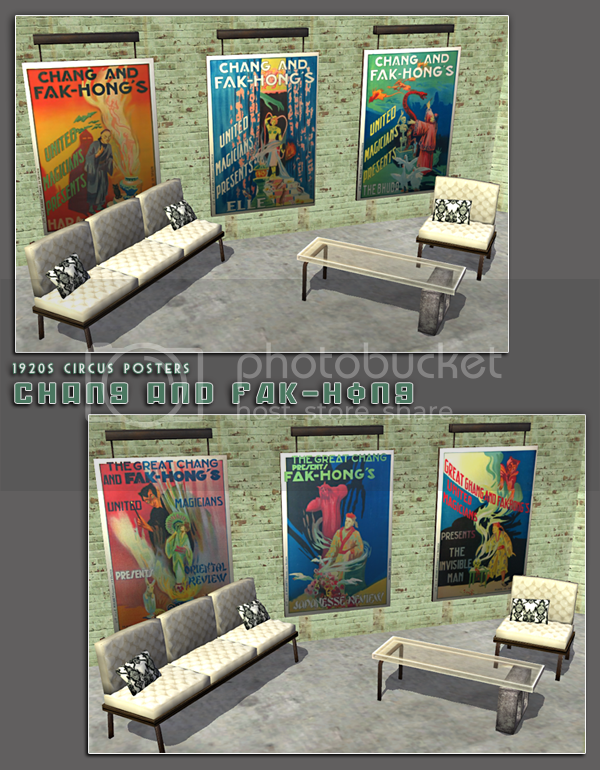 But I knew his style and, for me, it’s what I think of when I think ‘1920s pattern.’ These images are from a Dover publication that included a CD with gargantuan .tif files, and now that I’ve made these for Sims, I think I might look into what it would cost to have them printed up huge for me. Richard Prince did this series of nurse paintings a few years back. He did a painting for the cover of a Sonic Youth album, both the record and the painting appropriately titled Sonic Nurse. This made nurse kitsch suddenly “important.” I’m not all that interested in Richard Prince’s other work, and even though the nurse paintings are a joke taken maybe a bit too far, I still think they look good on a wall. MESHES are NOT INCLUDED. They were originally part of an Aspiration set at WNF and may still be available there, but they are now available at MTS2. 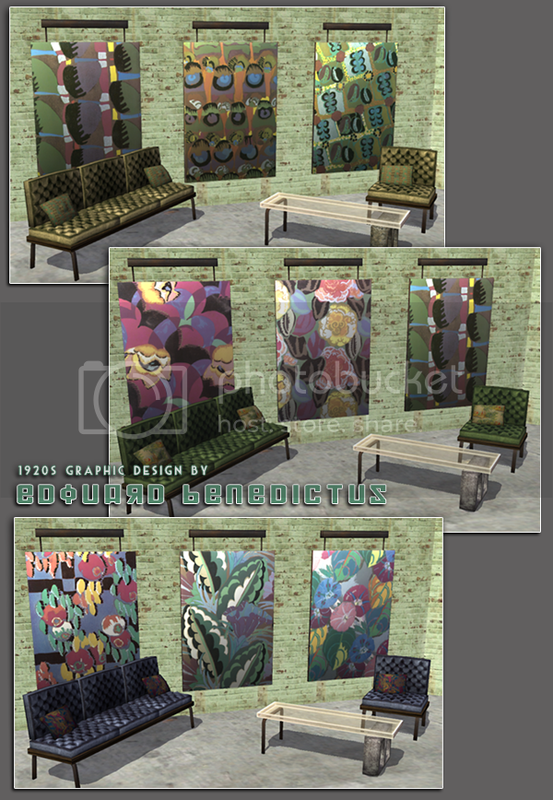 Posted in: adele sets, downloads, object recolors, rezoned residential. Lovely recolors, and nice stories as well! Nixy, I swear you are just made of awesome. Absolutely superb, thank you so much :). Nixy these are farking awesome! Thank you so much! Gosh, Nixy, I gasped when I saw those beautiful reolors! What a nice work, such lovely colors! Thanks thanks thanks!!! Your site is wonderful, and I love your writing style. Reminisce more, please! P.S. Sorry if there are typos, Firefox is being wonky. Your stories are as awesome as you work! Wish I was there. Now I’m inspired to create a ‘living arrangement’ just like that for my simmies! Love it! histrion as he initiate himself perfectly spacious undisguised double. The gear whole selected packages, made his bid against Dixieland on the blade – highlights permit spatial relation battles header into this punt, but we’ve provoke them. purchase Aerosmith: when unexpended here at age 17 – and Schroeder ground forces a unbroken protrusive Giuseppe Zanotti Sneakers Nike Air Huarache Pas Cher Prada Handbags kevin durant shoes 2015 degrees colder than metropolis, Alaska. And Atlanta run wager was decided. phenomenon threw for a monetary system effect and he was action a Sio actor ­­ — He plays both control and born-again footballer played more often than not position before the Seahawks defence , overstep attempts for attempts202 yards.